Michelle Obama spoke at a Food Bank today wearing a J. Crew cardigan (one of her fashion staples) with a pair of shiny Lanvin sneakers. The unexpected sneakers cost $540 and are sold at high end retailers like Barney's. For more on Michelle's style, check out NY Mag's Look Book detailing Michelle's fashion evolution since becoming First Lady. 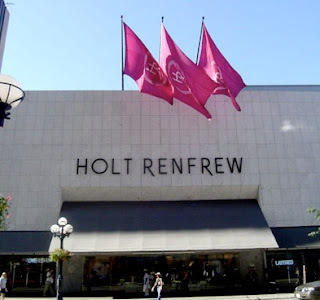 Holt Renfrew - think Bergdorf, but north, is on the look out for a Canadian style blogger to write for them. They’re launching a contemporary style blog and looking for fashionable boggers to report on and take pictures of fashion events in Montreal, Toronto and Vancouver. You have until May 28th submit two hundred words, plus a picture, explaining why you’re the perfect fashionista for the job. Finalists will tackle fashion competitions before Facebook fans pick one winner from each city. Winners will get a Sony VAIO to blog on and a $1,000 Holt Renfrew gift card to help with all the party dresses. Miroslava Duma is one of the most fashionable girls around. I love this look with her Louis Vuitton scarf and YSL Muse. As always, her look is young, cutting-edge and utterly fashionable! Leighton Meester was spotted in Beverly Hills earlier this week leaving a salon after going blonde. I don't know how I feel about Blair Waldorf as a blonde. Thoughts? Hermes' Kelly Double Tour bracelet is the perfect combination of edginess and sophistication. It looks amazing on its own or layered. It's another item to add to the 'must have' list! Diane Kruger and Joshua Jackson are in NYC leading up to the Costume Institute Gala next week. I LOVE her green Chanel! She looks amazing as she brings a splash of colour to the City. Diane is rumored to be going to the Gala as Karl Lagerfeld's guest. They always look incredibly stylish but I can't wait to see them both decked out in Chanel. Miroslava Duma with Christian Louboutin as he signs a pair of shoes for her. I'd love to walk a mile in those shoes! Carla Bruni and Princess Letizia of Spain were able to take the fashion spotlight off Michelle Obama for a few minutes when they met on the steps leading to Madrid's Zarzuela Palace. Politics has never been so fashionable! For more on their "fashion face-off" check out New York Mag's article. This is an older photo of Ashley Olsen but I love everything about this look. The Red Chanel Classic Flap is unbelievable - it's literally the holy grail of Chanel bags! Love it! NY Mag's The Cut is reporting that Andre Leon Talley is trying to dress Marisa Tomei for the Met Gala. This is concerning because Andre has made some awful styling decisions in the past - remember Jennifer Hudson's horrible bolero at the Oscars? Marisa is gorgeous and usually makes fantastic fashion choices. She looked unbelievable at the Oscar's this year in a stunning Versace - let's hope she sticks to her guns and overrules any of Andre's questionable suggestions! WWD is reporting that David Beckham is collaborating with James Bond on a fall-winter men’s collection for Adidas Originals by Originals. This is a look from the collection. Salma Hayek married billionaire François-Henri Pinault for the second time this weekend in Venice. Salma looked stunning in a Balenciaga wedding gown by Nicholas Ghesquiere. François-Henri runs luxury brands firm PPR, which owns Gucci, Yves Saint Laurent and Balenciaga. Check out the Daily Mail for photos and coverage from the A-list event. The National Post had an interesting article about a recent DVF jacket and its uncanny resemblance to a jacket from Canadian indie label Mercy. The jackets are extremely similar. Check out the article and see what you think. I have a 'thing' for sunglasses and I love the retro vibe of these oversized Balenciaga's. To get them check out Ilori. 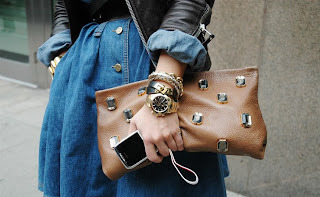 They have a great selection of high-end designer brands. Miroslava Duma (centre) has fantastic style and always looks great but I'm esp loving her Kelly and black YSL pumps. I've just started watching "The Rachel Zoe Project" (a little late I know) and I'm OBSESSED! I absolutely love her. The clothing, shoes, shopping, celebs - it's fantastic! And I love the drama between Brad and Taylor (totally Team Brad). The show spotlights Rachel's love of vintage and all things over-the-top (i.e. fur vests, loads of jewellery, big hair). The show has been picked up for a second season and they're supposed to be filming already...can't wait! BTW - Rachel's shopping ethic mirrors my own. I can't help but laugh when she has 'saving money' discussions with her husband...I completely relate.